I would love to win a copy of this book about a fascinating woman. How wonderful that a collaboration has brought forth such a fresh perspective on her. Can’t wait to read in the Footsteps of Anne Boleyn, sounds like a great book. Well done to both of you! I love how much passion you have for Anne and how determined you are to give us such wonderful resources to use. I’m always fascinated by the motivations that led authors to write the particular book that they did. As fascinating as why is how. A deeper understanding of the book is gained by having some insight into these two questions. Thank you for your work. It delights and enlightens me. I believe this is one of many historical lifetimes that calls out so clearly. Perhaps time is just another place that with the proper guide we each can transcend. Love Tudor history! Fabulous post! Fascinating,looking forward to the journey. I cannot wait to read the book! 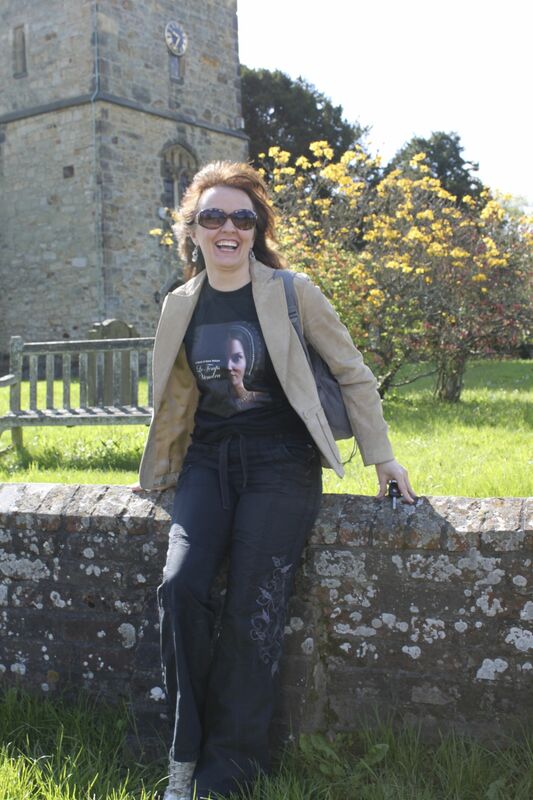 It must be so inspiring and fascinating standing or sitting at the same spot as Anne Boleyn did 500 years ago! Being able to visit all places related to Anne Boleyn is a true dream!! I have visited Hampton Court Palace, the Tower of London and Westminster Abbey and I was in awe just thinking that Anne walked there, along with so many other Tudor and other historical figures! I am so obsessed with all things Tudor and especially Anne Boleyn. I cannot read enough- this book is a must read!! I need another book~ and very soon because my family has asked me to please stop talking about the Tudors to them 😀 I would love to travel and retrace the steps of Anne Boleyn myself- that is definitely on my bucket list. Can’t wait to read all the articles on the virtual tour! I would love to learn more about Anne Boleyn and places she visited. I already know the basics about her life but it would be neat to learn more about the places she went and why. Very interesting how you both found each other. It’ s as if Anne herself drew you both together, and I’m so excited and can’t wait to get my hands on both In the Footsteps of Anne Boleyn and Le Temps Viendra II. I like many others here are fascinated by anything Tudor related, I wish I could get a hold of more books that are related to the subject. Thank you so very much for sharing your journey and allowing us all to see things through your eyes that we may not have ever been able to see at all otherwise. I can not wait to read the book I would love to win a copy as would many others who share the same fascination! I have always wanted to visit England, especially to see all the “Tudor-related” places! But yet, at 53, I still have not even been on a plane! I keep thinking about how one day I will eventually get there, but unless I win the lottery or some rich unknown relative leaves me in their will, it will have to remain on “the bucket list”!!! In the meantime, I can live vicariously through your book, and really look forward to getting a copy! It seems like a good book to have around as a reference and trip planner, in case I ever do get there…but if not, I can take an “imaginary trip” with your book! Thanks, lovely ladies for all beautiful pictures & posts, and congratulations on your book! I am very much looking forward to getting my hands on this book – it’s at the top of my holiday wish list! Thank you for sharing your stories and motivations. I’ve been fascinated with Anne Boleyn for years, and never had the time or the opportunity to do the kind of research that you’ve done. I’m also looking forward to this virtual tour. Thanks again for sharing! Every since “The Six Wives of Henry VIII” was on PBS when I was a teenager, I have been obsessed with Tudor History. Traveling to England has been my life’s dream but discretionary income has always been routed to more mundane expenses. I yearn to visit the castles, estates and countryside and stand where these fascinating people have lived. Having a guidebook such as yours for one of the most enigmatic women of the time would be priceless and surely a treasure in my bookcase. I can’t wait to read it and escape, even if just for a little while, into history! Congratulations, Lynn! You are one of the winners of the “In the Footsteps of Anne Boleyn” contest! If you can provide me with your mailing information (privately sent to my email address), I will make certain that your prize arrives to you! I love historical fiction and lately have been fascinated by Phillipa Gregory’s books on the Plantagenets. I would love to learn more about Henry the VIII and his wives especially Anne Boleyn. Your book sounds like I delicious treat. Lovely idea, sounds like a must read! Congratulations, Dodee! You are one of the winners of the “In the Footsteps of Anne Boleyn” contest! If you can provide me with your mailing information, I will make certain that your prize arrives to you! I am also fascinated with Anne, she was the reason I became interested in history of that time period. I haven’t found many factual books on her, here in my local library. But her story is one I would love to get to know, as you know it. I have been swept up by Tudor history and have read everything I could get my hands on in the past two years. This all began because of my lifelong respect for Anne’s daughter, Elizabeth I. Studying Elizabeth naturally took me back to studying her family. While I have yet to go to these places–I am across the pond in the US–I am developing a bucket list for all the places on the Tudor Trail, as it were, that I would love to visit. Thank you for creating such a wonderful book for people who want to travel in these footsteps! I’m with you both! I LOVE the space (including the buildings, streets, parks, wide open places) of ageless History. To walk in their footsteps, and dream of ‘what ifs’ and feel their dreams, their presence. That’s real History to me. To step back in time. I love the Tudor era. I can’t wait to read this book. I look forward to reading this book with interest as it was quite fascinating to find that we are decendants of Anne Boleyn through my mother’s side of the family. Both Sarah and Natalie are talented writers. I have truly enjoyed the book (and I am not entering the contest as I have my own copy.) If you don’t have a copy, it is well worth the price. It is wonderful to read a book written by someone who also stands in one place and tries to “feel” the past! I thought I was the only one who did that. What a great article! I too feel very connected to the last when I visit historical places and walk in the footsteps of these great people! I just finished LTV 1 and I can’t wait to read the second book and in the footsteps of Anne Boleyn. I was fortunate to be able to visit London last winter and was in awe of being in the place where my heroes once frolicked! I love to read about the Tudors! I’ve been a Tudorphile since 1973 and been to England many times. I can’t get enough of them. Will your book be available on nook or in hard copy? I have an Elizabethan coin circa 1574 that my husband made into a necklace for me and it has gotten me into many places at Hampton Court that are closed to the public. I understand the feeling that you get standing in places that Anne, Henry, and Elizabeth have stood. This is a great article and I look forward to reading your book. 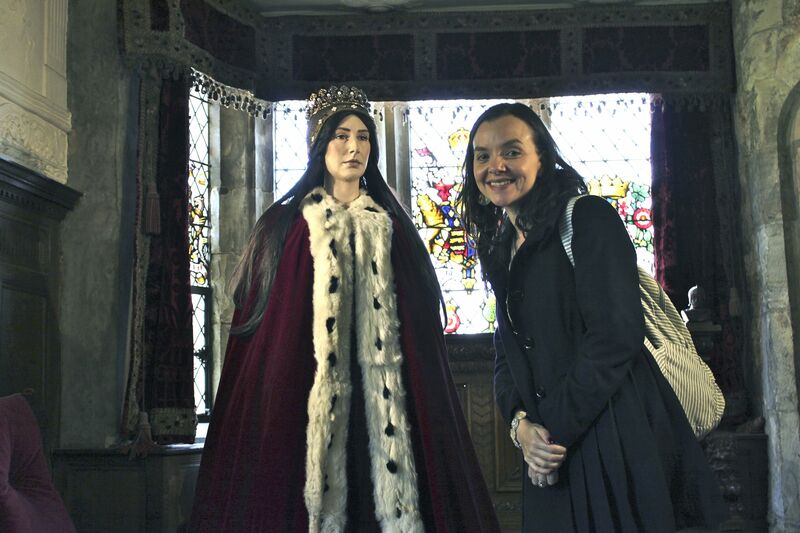 My university classmate, Emily Pooley, made this wax figure of Anne Boleyn for her graduation project. She is an amazing artist and it took the most part of a year to create it. She kindly loaned it to Hever Castle for their display. FYI, Emily’s wax sculpture is featured in my own book, The Creation of Anne Boleyn. I agree, it’s gorgeous, and she is an amazing artist! I am so excited to read this book, Anne is my heroine! I live in the US & unfortunely have not been to England yet, although the plan is for 2015. So would love to be able to read this book prior & use it as a guide for my trip. I have to say I can’t believe I didn’t find you all sooner. I have been obsessed with Tudor history for many years. I think it started with my visit to England in 1981. Just being in the Tower of London and touring Hampton Court you can not help but be struck and awed by the sense of place and history. A return trip to England is on my bucket list. I would love to win a copy I am a huge Tudors fan I literally own 30 books about it and 4 are about just Anne not including the six wives ones. I loved the books and honestly I want more lol! Very interesting topic! I’m looking forward to reading the book. I’m looking forward to reading this book, I have always been fascinated with Anne. One of my goals in life is to go to England and see as many Tudor historical sites as I can. I love the concept of this book! I have always wanted to walk down the paths taken by Anne Boleyn and discover who she really was. I have read so much about her that it would be amazing to see her path with my own eyes!!!! Ii am really looking forward to learning more about this amazing misunderstood woman!!! I am thrilled to have found Le Temps Viendra. Tudor history has always fascinated me and especially Anne. I know that she helped shape the history of England and received so little credit. Thank you for bringing a piece of her to me. I cherish the ttime I spend getting lost in these pages. A book so well written that the words written on the page stop being read and turn into a movie in my mind. That is the true testament to a great writer. As an American Historian with a BA Degree in Tudor History, I be very interested in a free copy. I have sent for the book, if I win , im donating it to My Alum University’s Carlow University in Pittsburgh Pa History Dept! I am sure They will enjoy this for their collection. And I will send you a conformation letter from Carlow University . Thank you for bringing Anne to life in our History! 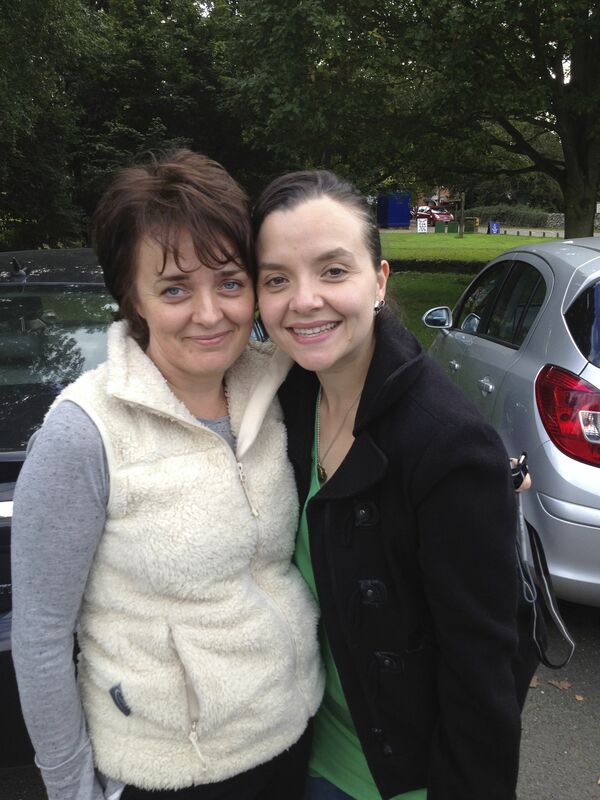 I am so envious of you two ladies! I would love to visit the places she spent her time at, to be able to make her more real in my mind. Historical figures are almost always like dreams or characters to me – I think from living in a place where there isn’t much rich, detailed history (Alaska), they seem almost surreal. I’ve been in love with history since I could read, and I’m still fascinated and compelled by it. I crave new books to read and to see these places someday. I would love to read your book, as a new perspective is always refreshing! So looking forward to reading In The Footsteps!! Love this era in history! “In the Footsteps of Anne Boleyn” will be the next best thing to actually visiting the UK, since I live so far away. I am also anxiously awaiting the second part of “Le Temps Viendra”. I am MORE than excited to read this book and I am very particular when choosing historical books to gather into my library. What makes the approach of Grueninger and Morris different (for me) is that both authors seem to want to portray a more 3-dimensional history rather than just: “what Anne Boleyn was like”. Life is never about one person and to get a realistic idea of what life WAS like for one person, one really needs to comprehend all of the aesthetics involved in addition to other people that had relationships with the subject. I so appreciate all of the factual documentation of the early Tudor period that has been provided by so many authors and historians. I also appreciate factual documentation that has been further explored and carefully analyzed. That said however, a life is more than documented facts. There are many “facts” about my life but those facts are merely “points of interest”: They don’t tell my story. For Grueninger and Morris to have found each other through a shared interest and then be able to collaborate on this project is such a blessing. I am but one of many who are really looking forward to going on this journey with the authors. What a great article. I can’t wait to get this book. I would love to follow in Anne’s steps. I often wonder if she would have done things differently had she known the outcome, but so much of English history is what it is because of the life she lead and the choices she made. I love that you have made this journey and are sharing it with us! When my husband and I make it overseas (we are in the US) we hope to visit many of the places you have traveled. It will be a wonderful experience for us both since we have a mutual love for Tudor history! I really love how you have made history real, alive from the pages and into my house! Have read masses on the Tudors and simply cannot get enough. Thanks again for presenting a different insight into this great period. Great article!! Love both the authors! I enjoy reading anything about the Tudors. Can`t wait to read this book. Would love to win a copy to add to my collection. I have been fascinated with the wives of Henry the VIII for many years, my particular favourite has always been Kathrine of Aragon, I never really took to Anne Boleyn so havn’t read as much on her. But hearing the passion Natalie and Sarah have, it has made me think maybe I have been missing something, I will be reading much more on her in the future. Great article. I’m fascinated with history. The thought of standing & walking in the same places as the people you read about in history books just excites me. One day i’ll travel and walk in their footsteps! World of history is fantastic tudor history is so amazing!! What a great giveaway, and fascinating post! What a wonderful idea for a book! I would so like to trace the footsteps of Anne Boleyn, to go where she went…what an amazing journey that would be. Perhaps on my next trip across the pond I can. I cannot wait to read this book! I have my whole life been drawn to the English life and culture. Although I am European, I was not in this lifetime, English. This did not stop me however from saturating my life with English history, Renaissance Reenactments, attending SCA events, wearing period clothing, reading books, watching documentaries, movies and just this summer, finally making to Europe. Standing in gothic cathedrals, castles and towns transported me back in time that no other way ever has. There is an energetic footprint of past people and events that cannot be experienced unless you are there. Since this was and will be my only overseas trip, I am so very much looking forward to your book to transport me back again. You two get it and understand what it is of that I speak. Thank you. And yes, this really is my email, for more than 20 years now!! …”Anne was betrayed and abandoned by the man who spent years pursuing her relentlessly…” – that sums up what I think of as the horror (other than the imprisonment and beheading) of being Anne Boleyn.